World stocks slumped, European assets sold off and the Euro dropped to a three week low on Tuesday after anti-euro comments from an Italian party official sent renewed shockwaves across Europe and the globe, and pushed Italy’s bond yields up to multi-year highs. Italian assets tumbled for a second day, after the economic head of the ruling League party and head of lower house budget committee - and a well-known euroskeptic - Claudio Borghi said that most of Italy’s problems could be solved by having its own currency: "I am more than convinced that Italy, with its own currency, would be able to resolve its problems," Borghi said in an interview on Radio Anch’io, adding that the euro as common currency "is not sufficient" for Italy to solve fiscal issues. In kneejerk response, Italian 10Y yield continued their Monday selloff, spiking to 3.438%, the highest level since early 2014. Borghi also said that like France, Italy shouldn’t be subject to attack from EU officials, adding that if France’s spread started widening, “at a certain point they would raise their hands and say ‘OK let’s intervene’.” He concluded that Italy would have declared a 3.1% budget deficit for 2019 instead of the 2.4% it has set, if it had wanted to go up against the EU, adding that the govt is aiming for a level that’s "enough for our country to feel a bit better." Borghi's comments followed a statement by European Commission President Jean-Claude Juncker who compared Italy with Greece, saying "after the toughest management of the Greece crisis, we have to do everything to avoid a new Greece - this time an Italy - crisis." ... and shares in Italian banks, which have large sovereign bond holdings, sold off sharply to hit a 19-month low, down 2.8 percent. Italy’s FTSE MIB tumbled as much as 2%, hitting its lowest level in 18 months amid budget concerns, before recouping some of the losses. Subsequent attempts by Borghi to talk back his comments were unsuccessful, when he told Bloomberg TV that "there is no plan to leave the euro within this government regardless of my personal conviction." The deficit is “not a revolutionary move” and “we are not mad, we are not Maduro Venezuela or something like this,” Borghi said. There was little reaction to this subsequent commentary, meanwhile Euro zone banks dropped 1.3% as the comments reignited investors’ anxieties about contagion to euro zone finances from Italy’s higher budget deficit plans, which the government set out on Thursday. "While our economists do not expect systemic implications for the global economy, contagion risks have risen,” Goldman Sachs analysts warned. “We think European risky assets remain vulnerable and there is potential for negative spillovers to the Euro area given the high trade exposure to Italy." In response to Goldman's caution, the EURUSD continued its selloff for a fifth day, sliding 0.5% and touching its lowest since Aug 21 at $1.1505 and last trading at $1.1517, after hitting 1.18 late last week. The single currency has been hurt not only by renewed redenomination fears as a result of Borghi's comments, but also by concerns that a significant increase in the Italian budget will deepen Italy’s debt and deficit problems, and by extension the European Union’s. "The history of the euro zone tends to be one of great fudges - think of the case of Greece," said David Keir, manager of the global income and growth fund at Saracen. "But I would caution against any wider systemic spreading. The reality is making kneejerk reactions to big political decisions can very much be the wrong thing to do." The Stoxx Europe 600 Index fell for only the second time in six days as equities in Italy declined. Amid the risk-off mood the dollar climbed against almost all its major peers and emerging-market assets dropped. The pound fell as Brexit and the annual conference of the governing Conservative Party continued to dominate headlines. Meanwhile, as Bloomberg's Garfield Reynolds observes, Italy's budget woes once again threaten to blow up EM FX as "the blowout in BTP-bund spreads is hammering the euro and also hurting risk proxies such as AUD and NZD." "That threatens to send a fresh wave of contagion across EM assets just as investors were hoping they had got past the aftershocks from the crises in Turkey and Argentina." Reynolds wrote in a Tuesday note. "A fresh burst of USD strength will be most unwelcome, with the KRW's late slump a sign of things to come. Each Italian yield eruption makes it that much harder to conclude that this European sovereign debt dilemma won't end in tears. It also will keep investors cautious and avoiding volatile plays, like EM assets." 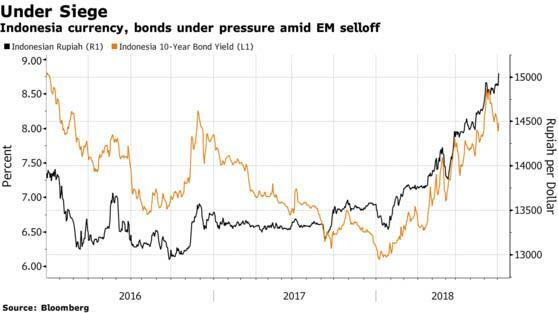 Sure enough, also overnight Indonesia’s rupiah weakened past 15,000 per dollar for the first time in 20 years as sentiment toward emerging-nation assets soured and oil prices jumped. The currency has tumbled almost 10% this year as rising U.S. interest rates have boosted the dollar and Indonesia’s current-account deficit has left the economy exposed to the financial turmoil that afflicted Turkey and Argentina. Crude prices have almost tripled since February 2016, ratcheting up the cost of imports. The currency plunge is taking place even as the central bank has raised interest rates five times since May to shield the currency from the emerging-market rout. Earlier in Asia stocks in Hong Kong underperformed as traders returned from a long weekend, and equities also fell in Australia and South Korea. Japan was a bright spot as the Nikkei 225 Stock Average ticked up a day after closing at its highest since 1991. China’s financial markets remain closed for the week of Oct. 1-5 for national holidays, but China’s weaker manufacturing PMI surveys over the weekend also hit Hong Kong stocks. As Bloomberg notes, "while a deal between the U.S. and Canada to revamp the Nafta trade deal with Mexico gave global risk appetite a boost at the start of the week, investor sentiment remains fragile amid a laundry list of threats to markets." Also overnight, Sino-American tensions were back in focus after the Chinese navy came within 45 years of a US Misile Destroyer from waters near South China Sea islands, in Beijing’s account of the incident. Meanwhile, political drama in Washington still swirls around President Donald Trump’s Supreme Court nominee, which may feed through to November congressional elections and affect the outlook for the administration’s agenda. As a result of the renewed Italian jitters and the last minute renewal of the NAFTA 2 deal, the dollar traded at a three-week high, weighing on emerging markets stocks which suffered their biggest one-day losses in a month. The greenback drew support from an uptick in U.S. Treasury yields as Wall Street gains curbed demand for safe-haven debt, although so far the 3.11% level has proven insurmountable for 10Y yields, which were down 3bps on Tuesday morning. Elsewhere, oil prices recoiled slightly, having hit nearly four-year highs in the previous session. Crude contracts surged nearly 3% to $75.77 a barrel on Monday, the highest since November 2014, as the deal to salvage NAFTA stoked economic growth expectations, with impending U.S. sanctions on Iran seen raising prices. Brent crude edged down 0.2 percent to just under the $85 a barrel level, after rallying 2.7 percent the previous day to a $85.45, highest since November 2014. Expected data include Wards total vehicle sales. Lamb Weston, Paychex, and PepsiCo are among companies reporting earnings. President Donald Trump looks to be preparing for a potentially protracted economic war with China. He’s recently struck a last-minute deal with Canada and Mexico, signed a trade agreement with South Korea and convinced Japan to begin bilateral economic negotiations. The North American accord also includes provisions seemingly aimed at keeping Chinese products out of the region. Former foreign secretary Boris Johnson will arrive at the Conservative Party’s annual conference on Tuesday to make a speech that shows whether he still has a chance -- or the will -- to gun for the top job in British politics and be prime minister of a party at war with itself. Randal Quarles, the Fed’s vice chairman for supervision, is vying with the head of the Dutch central bank, Klaas Knot, to lead a watchdog panel for the global financial system -- Basel- based Financial Stability Board -- after Mark Carney steps down on Dec. 1. Indonesia’s rupiah weakened past 15,000 per dollar for the first time in 20 years amid a souring of sentiment toward emerging-nation assets and as oil prices jumped. Asian stocks traded mostly lower as the upbeat sentiment from the USMCA deal seen on Wall St. faded away and trade concerns re-emerged after White House Economic Advisor Kudlow said a trade deal between US and China is not “imminent”.ASX 200 (-0.8%) was dragged lower by the financial sector as Australia’s big four traded with losses in excess of a percent after the ACCC said they will examine the banks, while Nikkei 225 (+0.1%) was cushioned on the back of currency effect. Elsewhere, Hang Seng (-2.4%) underperformed as participants come back from the long weekend to downbeat trade comments from the US, meanwhile KOSPI (-1.2%) was also weighed by the sour sentiment as the index shrugged off optimistic industrial production data. China's narrowing interest rate spread with the US and declining current account surplus have led to some concerns regarding capital outflow. BoJ’s September Tankan Corporate Price Expectation Survey stated Japanese firms sees Y/Y inflation at 0.8% (Prev. 0.9%); 3yr and 5yr expectations unchanged at 1.1%. 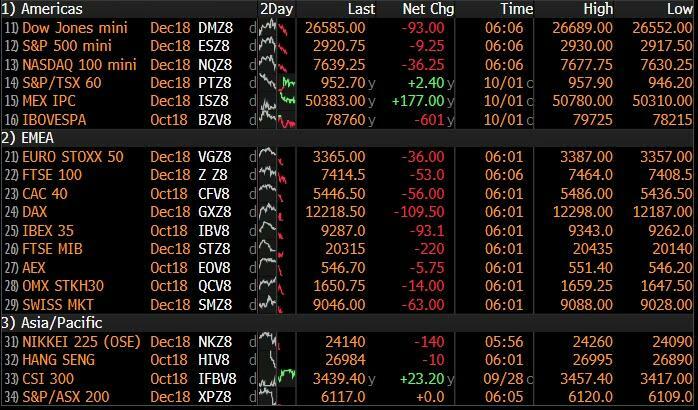 European equities have started the day in the red. This comes after suggestions from Italian Lawmaker Borghi hinting that the country would be better off leaving the Euro. Despite an intention to leave the Euro later denied by the Deputy PM, Italian assets are seeing significant losses, with Italian Bank stocks down over 2%, and the FTSE MIB once again at the bottom of the index pile. The financial sector is lagging its peers due to the weakness in Italian banks, with the energy sector outperforming off the back of oil prices hitting 4 year highs. The FTSE is the outperforming bourse off the back of a Brexit-hit GBP, but is trading in negative territory. The index is being pressured by a collapse in Royal Mail shares after a guidance cut in Monday’s trade, with the co. extending losses in the European morning. The stock is now at the foot of the Stoxx 600 and has hit the lowest level in its lifetime. In the oil market, WTI is hanging around the USD 75.40/BBL level and unchanged for the day after the benchmark hit four-year highs in early European trade. Production figures were released from Russia for September, who said this stood at 11.36mln BPD vs. 11.21mln BPD in August. In the metals sector, gold is marginally in the green as the yellow metal has caught a safe-haven bid in the Italy driven risk-off tone. Copper prices have fallen for the second straight session after slowing growth in the Chinese manufacturing sector has continued to stoke concerns over demand for the construction material. The day ahead is a fairly sparse one for data releases. In the US, the only release of note is September vehicle sales data. It is however a busy day for central bank speak. Over at the BoE both Carney and Haskel are due to chair panels at a conference in London this morning while the ECB’s Villeroy de Galhau is due to make a speech this afternoon at an OECD event. Meanwhile the Fed’s Quarles is due to testify before the Senate banking committee this afternoon after which Fed Chair Powell speaks at a NABE meeting discussing the outlook for the labour market and inflation. Dallas Fed President Kaplan is also due to speak in the evening at a separate event. Morning from the US. I’m en route to our annual Leverage Finance conference in Phoenix. It’s one of the largest if not the largest in the industry and a major gathering for investors and issuers each year. If you’re attending Wednesday and want to say hi please let me know. I landed in NY yesterday and after 23 years and 50 plus business trips here I finally tried the subway as a way of getting from JFK to downtown Manhattan to avoid chronic car sickness. Apart from getting lost, missing the express train connection to Penn St, changing trains 3 times and taking nearly 2 hours, it was a journey where my stomach remained becalmed. I love NY but the combination of bumpy roads, taxi drivers’ lack of finesse and the stop start traffic (mostly a jerky stop) makes this journey my most feared anywhere around the world. The subway it is from now on. Staying in the US, NAFTA – or should we say USMCA – politics won out over Italy and Brexit politics yesterday in what ended up being a mixed start to the week. The S&P 500 and DOW ended +0.36% and +0.73% respectively last night, while the NASDAQ and Russell 2000 of small cap stocks underperformed, closing -0.11% and -1.39% respectively. It was the sharpest day of small cap underperformance in seven years. The STOXX 600 had earlier closed +0.20% in Europe, with energy stocks leading gains as Brent crude oil eclipsed $85 and to a new four-year high. The Canadian Dollar (+0.73%) strengthened versus the Greenback while bond markets ended up flat to slightly higher in yield, as markets priced in another 10 basis points of Bank of Canada rate hikes through end-2019. The Mexican Peso retraced gains of +1.14% to close flat, while the Argentine Peso had its second-best day of the year, gaining +4.63% as the central bank recommitted to tightening policy. Last night 10y Treasuries finished +2.2bps higher and Bunds ended flat while the rest of Europe was broadly 2 to 3bps higher. Sterling – which ended broadly unchanged at the close last night – had a fairly roundabout session meanwhile trading as high as +0.80% from the day’s lows following headlines suggesting that PM May was preparing to compromise on the Irish border situation. More on that shortly. Elsewhere, it wasn’t quite the underperformance of Friday but Italian assets were again struggling to keep up. The FTSE MIB finished -0.49% while 2y and 10y BTP yields rose 29.4bps and 15.2bps respectively following a bit of a late session sell-off. Italian Banks (-3.05%) fell again meaning the 2-day move of -10.09% is the biggest since Aug-16 (-10.62%). This all came after criticism at a meeting of finance ministers in Luxembourg. France’s Le Maire said that budget restrictions for all EU member states must be respected by everyone while European Commissioner Moscovici said that Italy’s budget is a “very, very significant deviation from its previous projections and almost certainly violated the rules”. Dutch Finance Minister Hoekstra added that “the signals we’ve been getting so far aren’t very reassuring” while in the evening EC President Juncker warned of needing to do everything to “avoid a new Greece crisis”. Markets have been waiting for comments from the Eurozone and it’s unlikely that this is the last we hear but the next material event for markets is the approach itself from the Europeans – i.e. how quick and harsh the response is. Back to the US, where President Trump announced a new trade deal with Canada and Mexico, which he called “the most important trade deal we’ve ever made, by far.” The agreement adjusts the existing NAFTA framework with marginal changes, and the impact should be relatively limited, though the removal of a key source of uncertainty should be beneficial to businesses in all three countries. With access to US markets secured, further trade conflict between the US and China could end up benefiting Canada and Mexico, as their exporters may be able to seize market share. Such an escalation looks likely, with Trump reiterating his preference for using tariffs, saying that they were the key catalyst that brought Canada and Mexico to the negotiating table. The positive Brexit news yesterday was that Prime Minister May was said to be considering allowing regulatory checks on goods to take place between Northern Ireland and the UK mainland. Previously, May had rejected any barriers within the UK. In return for this concession, media outlets reported that May will aim for the whole of the UK to remain within the EU’s customs union as the backstop agreement. It’s not clear if this will be acceptable to May’s coalition partners in the DUP or to the more zealous Brexiteers, and the pound retraced it’s 0.80% intraday moves relatively quickly. Overnight it’s been another fairly quiet session in Asia with performance across bourses also mixed. The Nikkei (+0.18%) has built on its 27-year high however the Kospi (-0.69%) and ASX (-0.73%) are both lower. The Hang Seng (-1.61%) has also reopened with a sharp decline. As a reminder bourses in China are closed this week. Elsewhere futures in the US are down slightly while currencies in Asia are generally lower led by the Indonesian Rupiah (-0.66%) and South Korean Won (-0.48%). In other news, the final September manufacturing PMI revisions that were out around the globe yesterday didn’t reveal any great surprises. The Eurozone reading was confirmed at 53.2 which was a very modest downward revision from the 53.3 flash print. Germany and France were unrevised at 53.7 and 52.5 respectively while Italy came in slightly below expectations at 50.0 (vs. 50.2 expected) and the lowest since August 2016. Spain printed at 51.4 and also soft relative to expectations for 52.6. Meanwhile the UK surprised to the upside (53.8 vs. 52.5 expected) although the report did sound a little bit more downbeat about medium term expectations for the sector pointing to both supply constraints and Brexit uncertainty. Later in the day the US PMI was unrevised at 55.6. Shortly after that, we got the September ISM manufacturing report in the US. The 59.8 reading was a shade below expectations for 60.0 but still the third highest reading this year and above the six-month moving average of 59.2. Interestingly, the prices paid component was much softer (66.9 vs. 71.4 expected) however the employment component (58.8 vs. 58.5 expected) was still strong and indicative of a solid read-through to the employment report this Friday. So still a robust growth outlook, though ISM respondents said they were “overwhelmingly concerned” about the latest tariffs on imports from China. That generally solid set of data at least appeared to overshadow any negative read through from comments by the IMF’s Christine Lagarde yesterday. Lagarde said that risks the IMF had highlighted six months’ ago “have begun to materialize” and suggested that global growth forecasts are likely to be cut when the fund updates its World Economic Outlook on October 9th, warning also of trade wars and tighter credit. Currently, the IMF’s 2019 global growth forecast is for 3.9%, marginally higher than our economists’ forecast for 3.7%. Finally, the day ahead is a fairly sparse one for data releases. This morning in Europe we’ll get September house prices data in the UK followed by the August PPI report for the euro area. In the US, the only release of note is September vehicle sales data. It is however a busy day for central bank speak. Over at the BoE both Carney and Haskel are due to chair panels at a conference in London this morning while the ECB’s Villeroy de Galhau is due to make a speech this afternoon at an OECD event. Meanwhile the Fed’s Quarles is due to testify before the Senate banking committee this afternoon after which Fed Chair Powell speaks at a NABE meeting discussing the outlook for the labour market and inflation. Dallas Fed President Kaplan is also due to speak in the evening at a separate event.